I feel like I should write something philosophical instead of just discussing my mundane life. Oh, here it comes! I do have something philosophical (and mundane). It has been cold here and snowy. The kids missed school two days last week. My husband is busy taking care of cows; thank God nobody plans to have calves any time soon. Last week he said something about cleaning up the shop so he could get his pickup in so it would start so he could go do the things he needs to do. Lows have been close to -20 a couple of times. It is -5 and dropping as I write this. I told him I would clean out the garage. He said something that amounted to “yeah right.” I got three kids out there and we cleaned up the side we don’t park in. It was ready for the pickup when he came back, and he was pretty surprised. So my garage is clean. My bedroom is almost too messy to walk through. I have Mt Laundry on the couch again and the kitchen is a never-ending process. The living room floor is relatively clean, and the furniture even got dusted this month. The coat room and laundry room and even the office are pretty darn clean too. I feel like I am shifting my mess around. I didn’t put anything from the garage or coat room in my bedroom, but somehow the mess seems to migrate. Some part of the house always has to be the catch-all. As you can see I was unable to put that in a neat little package like OBL does with her parables. Sorry. Today GrandpaDaddy chopped ice in the water tank out at the cornfield, I chopped it at noon and tonight it was solid again. He rigged up some tank heater/generator thing and plans to use it for a hot tub by morning, maybe. I will send him with a rubber duckie just in case. It would sure cause people to slow down and stare. Anyway, he has been busy taking care of critters. A person should think of that when they grocery shop, someone out there in -2 or even colder weather making sure your future food has water and feed. I plugged the lights in to see which one was the string we could use on the tree and four strings of lights were only half lit. (If only it were me…) Clearly I need to toss some things. Even the pretty blue lights I got LAST WEEK for the kids’ tree only half lit up. I haven’t given up on that one, but it is discouraging. So I bought new lights. I hate living in a world where I am expected to annually dispose of things that should last for a long time. They all say “Industrial Grade,” like they are supposed to be sturdy. So what qualifies as industrial? I would say four little kids and a kamakazi kitten would come close. In other news, I wrote a Christmas letter for my grandmother. She always sends cards out, and she won’t be able to this year. I wrote it, printed it off, and put them in addressed envelopes. I then put them in a box to mail to Dad so he can return address them and stamp them. As I was doing this I realized that I still hadn’t made it to the Dr’s office. He wanted my kidney stone so he could test it. I think I am going to wrap it up pretty and mail it to him, because I don’t have time to drive it up there to him. He has a good sense of humor, I hope. Anyway I am kinda bummed I don’t get to keep it. So here is a photo. So, clean garage, messy house. Cold, ice, lights don’t work, ouch. No real theme, but that pretty much covers it. Kind of funny the things we write when we probably should be in bed sleeping! As a city girl, I never would think of what needs to be done for my future food when the temps fall so low. But thanks to Xangans, I’m learning! Glad you passed your stone, and thanks for sharing the pic! LOL! 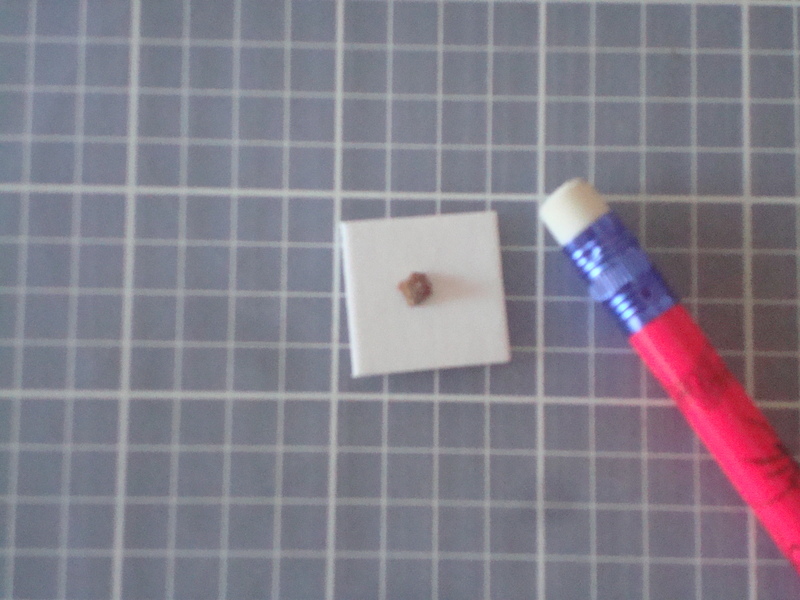 I don’t know much about kidney stones, but that sure seems like a large one to me. I hope your doc likes the gift! LOL! You just made me realize a treasure I didn’t know we had. We have 5 hot tubs~ if your talking stock tanks with heaters in them. Five kids~ five heated stock tanks. Grab your towels kids~ Loved this! @jo63psalm – Ha. A urologist would laugh at that puny stone. But then I don’t know any urologists who have had the pleasure of a kidney stone. It was strange, it only hurt on Thanksgiving morning, and it didn’t come out until about 10 days later!And yes, I can’t agree more with the fact that my time would have been better put to use by sleeeping. Sometimes I just have to write and you guys get the brunt of it. I notice you read it only minutes after I wrote it…. that kidney stone is amazing. ugh for coldness and outdoor stuff. water tanks….I want a pic of you and your family in that hottub horsetank! I’m cracking up about the pencil for scale. I don’t know why, but that seems hilarious. My laundry mountain is in my bedroom. It’s bad. I could put a piece of furniture in it’s place if it weren’t there. Like, an armoire, or a loveseat. Instead, it’s laundry. I told Steven last saturday that I wanted to work on it and get it all gone but I can’t until after Christmas because I’m actually hiding Christmas presents for the boys in there. I wish that was a lie. But it’s not. @bethro78 – That is great! Nobody would think to look in the laundry, somebody might ask you to fold it! I loved the singers on your last post. I put it on my Facebook. The beginning of a bad country song. Either you get it or you don’t.